An activist group of shareholders led by a hedge fund has successfully pressured executives at FairPoint Communications to sell the company to maximize shareholder value. The buyer, Illinois-based Consolidated Communications Holdings, Inc., said on Monday it would acquire FairPoint in an all-stock deal worth $1.5 billion, debt included. Maglan will cash out its investment initially made after FairPoint went bankrupt, when the share price was below $4. As of 4pm this afternoon, FairPoint stock was trading at $18.85 a share, less than the $23 a share and 75% premium Tawil and Azarbad were hoping for back in August. But they will still walk away earners, selling at around $18 a share plus an additional 17.3% premium. Collectively, the two hedge fund managers control 7.6% of FairPoint’s shares. Consolidated Communications will inherit residential FairPoint phone and broadband customers in 17 states, most notably those in Maine, New Hampshire, and Vermont. But press releases from Consolidated showed little interest in the residential telecommunications business. Instead, Consolidated executives are looking at FairPoint’s business and enterprise customers, and the benefits of owning FairPoint’s 17,000 fiber route mile network. Critics suggest the deal effectively enriches shareholders while putting FairPoint’s existing debt and buyout on the new owner’s credit card. Consolidated will inherit $887 million of FairPoint’s current debt plus the $1.5 billion cost of the acquisition. The combined company will keep the Consolidated Communications name and FairPoint Communications as a brand will eventually disappear if regulators approve the transaction sometime in 2017. Lufkin, Conroe, and Katy, Tex. FairPoint customers and state regulators in New England expressed concern about the transaction. After FairPoint acquired landlines formerly owned by Verizon Communications a decade ago, the transition was described as “disastrous” by regulators, who received scores of complaints about service and billing problems before FairPoint ultimately declared Chapter 11 bankruptcy, mired in debt. 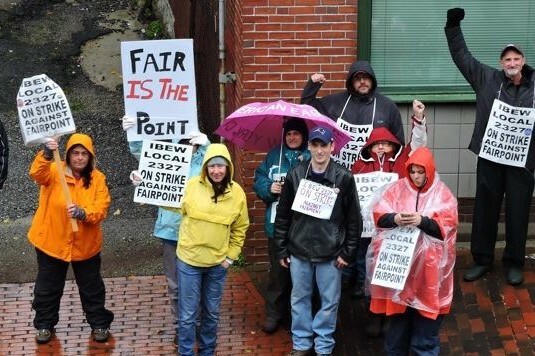 After emerging from bankruptcy, FairPoint has endured union strikes and was assessed multiple fines for failing to meet service quality standards in Maine. “The last time these assets were sold to FairPoint it was a disastrous outcome for Maine customers,” says Tim Schneider, Maine’s Public Advocate, who represents consumers on utility matters. Schneider told Maine Public Radio he is planning to scrutinize the deal to prevent further problems, but customers in Maine, New Hampshire, and Vermont are already expressing concern regulators are just as likely to rubber stamp this sale just like the last one, further saddling them with problematic service. Maybe the management at Consolidated will do a better job of delivering internet to customers than the people who were running Fairpoint under the direction of Paul Sunu.